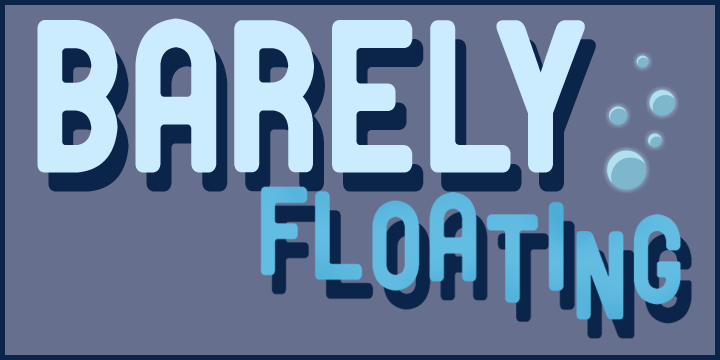 Adventure Game Studio | Forums | [ RELEASED ] Barely Floating - SUMMERBATCH!! Topic: [ RELEASED ] Barely Floating - SUMMERBATCH!! [ RELEASED ] Barely Floating - SUMMERBATCH!! This diarrhea ain't gonna cure itself. Impress youths with your inability to sing. A preview of the soundtrack by Sine Cadenza! Development began in mid-February this year with just the two designers. After that we got some scripting help and a couple of musicians to compose an awesome soundtrack for the game. In late April we had an alpha version ready for playtesting, ie. checking if the puzzles made any sense at all. And some of them did! Wow! After that it's been the usual fare, ups and downs, falling behind schedule, and a hell of a hurry to make deadlines. We're going into beta phase in a couple of days. After that it's going to be less than two weeks of hard work getting it finished and polished. There's still lots of eye candy stuff missing, such as walking to hotspots, cutscene stuff etc. 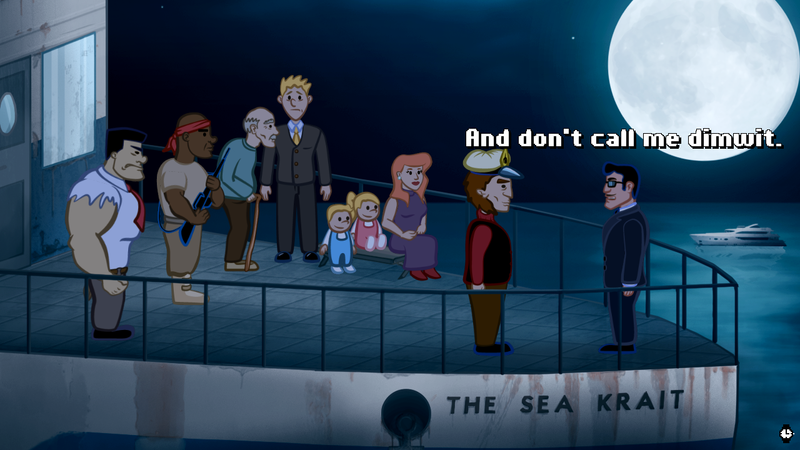 but the game is fully playable and background art and most of the essential animations are done. Yay! To be released sometime in July! Almost there! Just a couple of minor things left and we're ready for a couple of weeks of rigorous testing! One of those weeks may or may not be reserved for resting after a month long crunch. - The first 1280x720 resolution AGS game? - 15 rooms to explore! - Lots of lazily made animations! - Hitting bad guys with a cane! 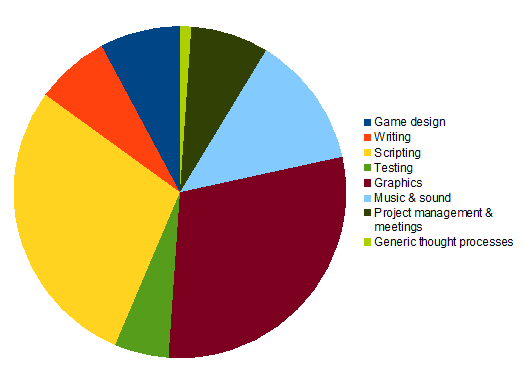 - Based on early alpha playtesting, at least two hours playtime! - Some technical magic that nobody really cares about. For the amazing Lua plugin and the even more amazing tech support! For motivation and finally luring me into making a game that's not for an OROW competition! For the custom resolution branch of AGS! This looks great. Love the art style and animation, and the storyline sounds fun. All the best with development! Hey, how cool! The story is completely original. Let's see where it goes! We want more information! Yuhuu! It'd be nice to see you mention Screen 7's involvement somewhere in your initial post? Good point. It's in the special thanks for now. Can't put it up top until it's official that we'll be included in the batch. I'm not a huge fan of the character art/the discrepancy between the characters and the backgrounds, but this still looks very nice and I'm looking forward to it. Keep it up. Sounds awesome! Will it feature any kung fu masters? Looks good AJA! 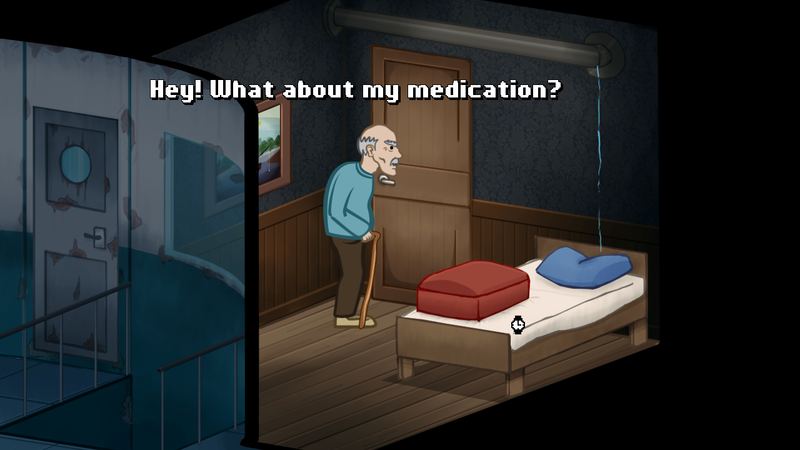 I was thinking the old man's pick up animation was too slow, before reminding myself that he's an old man! Interesting perspective you've chosen in that second screenshot. Those animations are not necessarily the same speed as in the game, especially the walking's way slower in the gif. And regarding perspective, I decided to go all the way orthogonal, or whatever it's called. No need to scale characters. Though, in the end, we had to scale in a couple of rooms in order to fit enough stuff on the screen. And of course, since it's a ship, things tend to slide around, and that's easier to do when you don't have to worry about depth scaling. Other than that, it's all designed around gameplay requirements. And regarding perspective, I decided to go all the way orthogonal, or whatever it's called. Anywho, I was thinking on throwing a podcast (didn't ask if AJA wants to be involved )regarding on making this game. Maybe few episodes, and I was thinking if you guys had some good questions we could answer. So throw me or AJA a PM with "podcast question" on the subject and we will answer it! Yes, questions for the podcast are very welcome. Holy crap it's a lot of work adding the finishing touches to interaction scripts (walk-tos, playing animations, changing facial expressions)! Eight hours and I only managed to get four rooms and their characters done. And that didn't even include the missing secondary interactions! My schedule is way too optimistic. I just hope I'm not adding any more bugs at this point. Update bump! That's the best kind of bump! It's been about a month of struggling to get the game finished and we're almost there! A couple of minor tweaks left and we're ready for proper testing. What a relief to get this finally finished, phew. Also, check the new screenshot in the first post! Haha, love the way those guys are looking at each other like "WTF?" Looking like fun there, AJA! This sounds like an original idea. 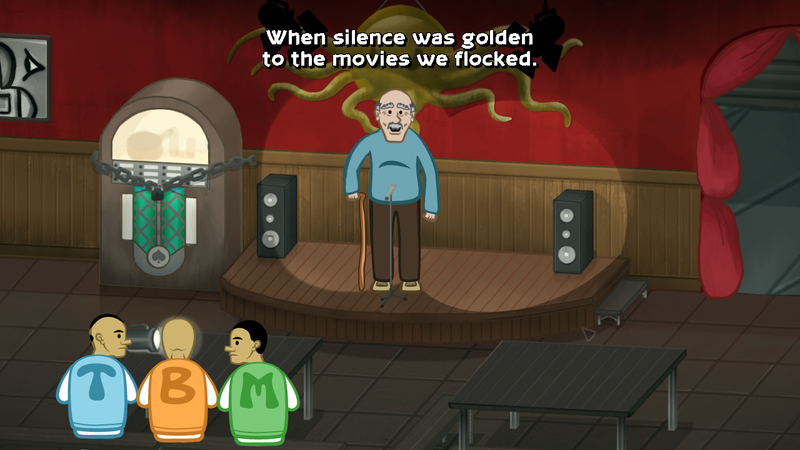 I don't think I've played an adventure game that stars a cantankerous old dude. The blocky font's a temp font that was used in my previous game, Barrier. The one in the third screenshot is the final one. If the criticism was directed at this font, then there's no explanation I can provide to make it better. Sigh, and I wrote the wrong Sini's last name in the credits. I've fixed the first post. Sorry. Re: Barely Floating - Game finished & trailer available! The last batch of minor bugs was fixed yesterday, so the game's essentially finished! Now all we've got to do is wait for the release of the Summerbatch, yay! This game took approximately 1050 man-hours to make, including the (reported) work of all the team members. If I'd worked on this full-time, all by myself, 8 hours a day, five days a week, that'd be 131 days, or approximately 5.5 months. In reality we worked on this for about five months, although we started quite slow in the beginning and ended up doing overtime for many days in the end. And finally, here, have an appropriately crappy trailer! Can't wait for the Summerbatch bundle to come out.